I am with Mr Kermode on this: remarkably unremarkable, and maybe that is not a bad thing. I do not quite see the need for such a remake, but once it’s there, I was happy to spend money on the ticket. Admittedly, for lack of choice, because all screens are jammed with it, in all its 2D and 3D versions. Of course Andrew Garfield is an eye-pleaser, of course the updated CGI is worth admiring. But the price is high: I think because the director and screen writers would have been bored themselves by really rolling out the genesis of the Spiderman story in detail again, the rushed it. A boy discovers his special powers, and within an instant he jumps off buildings and dons a spandex costume. 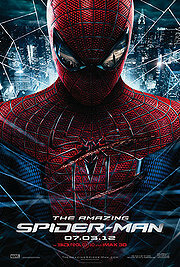 As a “Spiderman 1” movie, that is unsatisfactory, because the interest in that part of the story lies in how a regular guy copes with the fact that he is not that regular no more… I understand why they did cut some corners on character development (trying not to bore themselves and the part of the audience that has just watched Raimi’s Spiderman 20 times over the last ten years too much). They do, however, not offer a great alternative: skipping the development of Spiderman requires a good reason to get to the next part quickly, but that next part is dominated by a pretty lame villain. While Dr Connors, the human, may be an interesting intellectual center piece in such a setting, the lizard he turns into is just a CGI version of the gen plastic dinosaurs I used to play with when I was little. And that part even features sloppiness: a bunch of policemen gets turned into lizard thingies, and we only get back to them once they are returned to their human form? Not that an army of lizards is better than one lizard (take this, James Cameron’s “Aliens”! ), but having an army of lizards and just having them sit tight on a street corner while other people are scrambling World Trade Centers? No, that was the other beast… but the building was very nicely designed. Good but not great, I too was not really on board for a reboot. I almost wish they had just skipped the origin story alltogether and just jumped in with spidey a few years after spider-man 3. I did like Garfield he seemed to imbody what I recall reading in the comics more than Maguire. Also Emma Stone is real easy on the eyes.